The Constitute Project helps people access, compare and analyze the world’s constitutions. 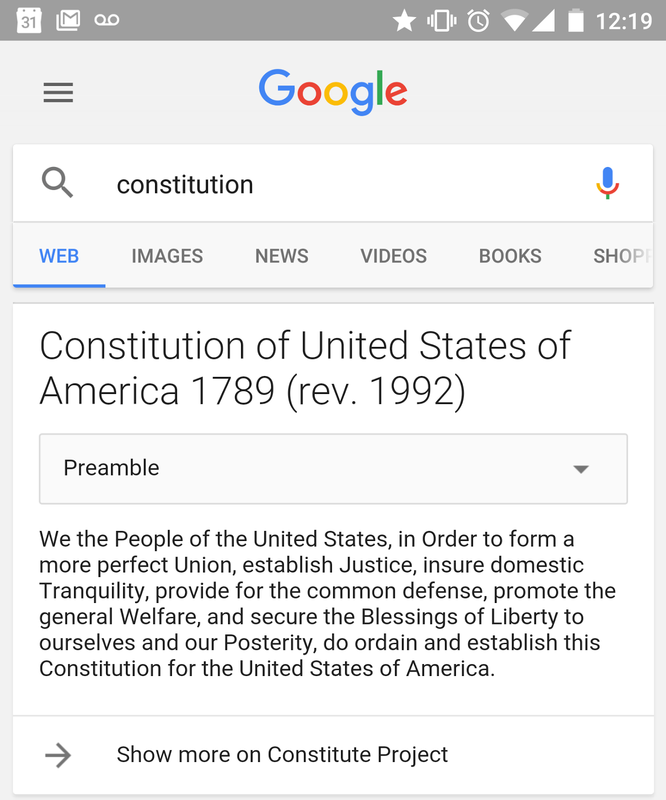 Now we’re adding more of this content to our search results, so you can find the full text for the United States Constitution—or constitutions from 12 other countries—right at the top of your search results page. 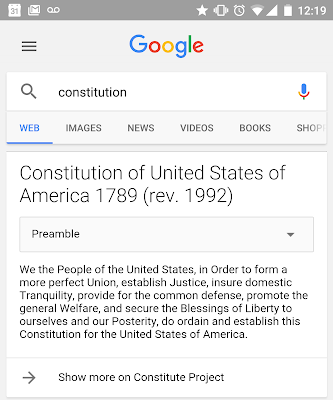 To try it out, type (or say) “constitution” into Google Search or the Google App and a box will pop up with the Preamble for the United States Constitution and a drop-down menu where you can see all of the accompanying articles and amendments. Besides the United States, you can find the constitutions for Afghanistan, Bhutan, Estonia, Finland, France, Iceland, Japan, Laos, Latvia, Micronesia, Norway and Ukraine. We’re starting with these constitutions and looking forward to adding more soon. We're excited to play our part in showing the world the common ideals that tie different countries together, and the differences that make them each unique. In the end, We the People...of Google are always trying to do what we can in Order to form a more perfect Search. Trying to remember how that famous phrase “We the People…” ends? Scratching your head over what’s included in the Tenth Amendment? Or maybe you need a refresher on how many amendments are even in the United States Constitution—or the Constitution of Japan, for that matter. Now (on Constitution Day, no less!) this information is more accessible than ever, thanks to our partnership with the Constitute Project.